The hill regions of India have been blessed with some of the beautiful, dignified and impressive rail line. The British colonial legacy of India left behind one important foundation which is still maintained and appreciated to this very day - a breathtaking railway system, known as Mountain Railways of India. The scenic mountain railways of India – there are three of them - are incomparable triumphs of engineering that have provided essential infrastructure for socio-economic advancement in these tough, inaccessible hill terrains. 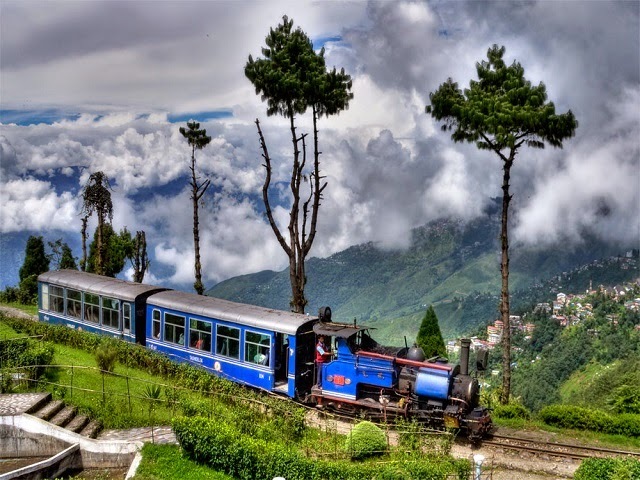 UNESCO has listed these three manmade marvels of the country – which include Kalka-Shimla, Nilgiri and Darjeeling Himalayan Railways - as World Heritage Sites. These narrow gauge trains with steam locomotives are operative in the rugged hill regions of Himalayas of Northern India and in the Nilgiri Mountains in the South. Immortalized in the song of the super hit Bollywood movie Aradhana, in which, then Super Star Rajash Khanna, driving his Jeep, is wooing his love-to-be Sharmila Tagore singing “mere sapno ki rani kab aayegi tu”. (O, Queen of my dreams; when will you arrive!) The Toy Train is a very popular and venerated train circuit in India. The Darjeeling Himalayan Railways, fondly referred to as the “Toy Train”, was the first and is still the most exceptional paradigm of a hill passenger railway. The train started its operation in 1881 and its design applies bold and nifty engineering solutions to the problem of establishing an effective rail link across a mountainous terrain of great beauty. The train offers the joy - riders a grand vista of the Himalayan snow peaks including the majestic Mt. Kanchenjunga (8598 m), world’s third highest peak. Many people remember this charming little train from the famous dance sequence “Chaiya Chaiya” featuring Shahrukh Khan in Bollywood superhit Dil Se. The construction of the Nilgiri Mountain Railway was started in 1891 and was completed in 1908. The railway is regarded as the marvel of engineering and the train itself is a charming blue and cream with wooden coaches and large windows. The 'Nilgiri Passenger' train covers a distance of 26 mi (41.8 km), travels through 208 curves, 16 tunnels, and 250 bridges. The uphill journey takes around 290 minutes (4.8 hours), and the downhill journey takes 215 minutes (3.6 hours). Nilgiri Mountain Railways has the steepest track in Asia with a maximum gradient of 8.33%. The Kalka-Shimla Railway built in the mid 19th century and this rail route features in the Guinness Book of World Records for offering the steepest rise in altitude in the space of 96 kms. The train is known for breathtaking views of the hills and surrounding villages. 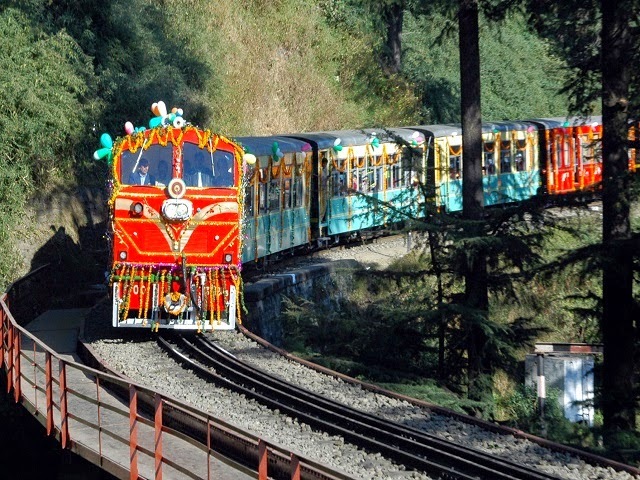 The Kalka–Shimla Railway was built to connect Shimla, the summer capital of India during the British Raj, with the Indian rail system. Now, Shimla is the capital city of Himachal Pradesh and Kalka is a town in the Panchkula district of Haryana. Spectacular scenery along the whole route, and the marvels of its construction, keeps the traveler on this line spell bound. On leaving Kalka, 656 meters (2,152 ft) above sea level, the railway enters the foothills and immediately commences its climb. The route offers a panoramic feast of the picturesque Himalayas from the Sivalik foot hills at Kalka to several important points such as Dharampur, Solan, Kandaghat, Taradevi, Barog, Salogra, Summerhill and Shimla at an altitude of 2,076 meters (6,811 ft). A confusing categorization of these trains is them being referred to as luxury trains in India. You must be aware that there is nothing like ‘luxury’ as you expect it. Whereas with luxury trains people normally visualize trains such as the Orient Express or the Palace on Wheels – in Indian context, the Mountain Railways in India are nothing like them when it comes to the luxurious interiors, restaurant and bars or for that matter contemporary amenity available in normal “luxury trains”. There’s only one sense of the word in which the toy train can be referred to as luxury trains. It’s more of indulgence and overwhelming elation which takes over you in an enchanting unforgettable ride of a lifetime. The most refreshing part of the journey by either of these trains is the experience of sitting by the window, breathing in the salubrious climate, beholding rolling hills and verdant stretches of valleys and taking in the greenery, smell of fresh dew on the vegetation, the chirping of birds or the sight of cattle grazing around the track. These journeys are truly fascinating and offer a ride of a lifetime.